It’s appropriate that I’m returning to regular Steven Universe duties now, as the show is ready enough to take things into the future that it’s sporting a new opening theme sequence. Pearl spent much of season one as an impatient know-it-all with few redeeming qualities, but she slowly broke down into the show’s most sympathetic character, with the above line in “Rose’s Scabbard” finally encapsulating her sad existence. “Rose’s Scabbard” knocked you out at the end, but “Sworn to the Sword” interrogates Pearl’s existential problem, and the result is the best episode of Steven Universe so far. 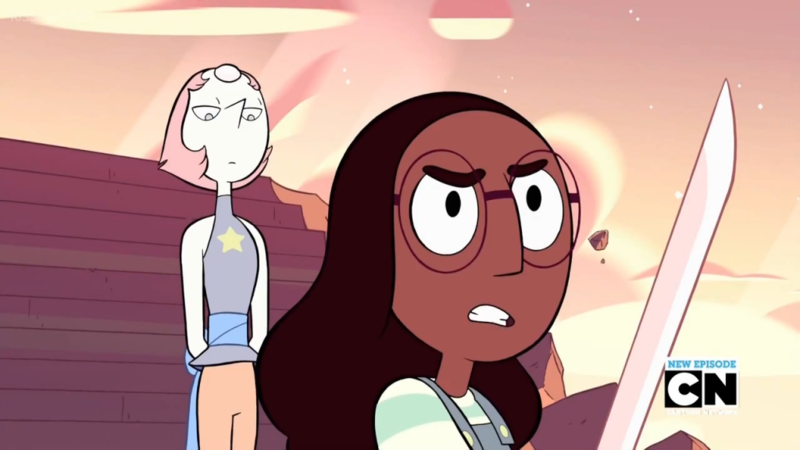 Pearl’s psychology is central to “Sworn to the Sword.” She prides herself on her sacrifice, and now not only is the one she was trying to save gone, but Pearl, with all of the things Rose confided in her, doesn’t even take her place as a leader, which might have provided some fulfillment. “She’s going to be an asset to you,” says Pearl. But Steven doesn’t want that. Steven wants the relationship we see when he and Connie duet “Share This Jam with Me” at the beginning of this episode. In fact, in “Full Disclosure,” right after the climax of “JailBreak!,” Steven’s big song, “Steven’s Lament,” worried that keeping Connie in his life would bring harm to her. And now Pearl is teaching Connie to sacrifice herself for Steven. I’ve often said that the reason Adventure Time is a better program than Steven Universe is that Steven Universe seems almost unwilling to tackle overwhelming sadness in the way that middle tier Adventure Time episodes like “Friends Forever” use effortlessly. That’s an odd complaint for a series where an overwhelming absence looms over everything, but for the most part it’s true, even if Steven Universe does gradually peel back the way said absence affects everyone and everything. The exception is Pearl. “Why won’t you just let me do this for you, Rose?” is an embarrassing, revealing moment for a character who doesn’t know what she is anymore. Steven and Connie confront Pearl after they find a new way, a better way (“This is much easier.” “That’s the idea”). How does anyone feel now? Joey's a 23-year-old who graduated from the University of Minnesota Morris and now lives in Minnesota's Twin Cities. He enjoys art, activism, and politics, especially when he's looking at them through a lens of popular culture. First and foremost he's obsessed with popular music, but aside from what you'd expect, he's also into comic strips, graphic novels, cartoons, and indie games made for mobile phones (his highest tile in Threes is 3,072). He'll tell you that his favorite book of all time is Goodnight Moon. He needs more people in his life who understand the joys of Achewood.